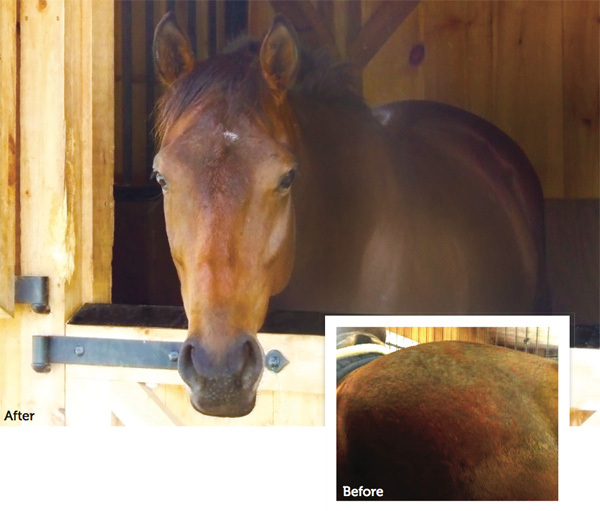 My horse, Vernon, suffered from very sensitive skin and general skin “funk” for nearly two years. If he wasn’t covered in hives, his hair was falling out. He was uncomfortable, unhappy and his skin was so irritated it felt like it was on fire when you put your hand on him. I tried various things including feeding him ground flax seed, which only gave minor relief. Eventually I spoke with a nutritionist, who suggested feeding him fish oil. I found SmartShine Ultra and decided to give it a try. It worked GREAT! Within two weeks, Vernon was visibly more comfortable and his coat started to grow in. Now, three months later, his coat is healthy and shiny and his skin is calm. He hasn’t had any skin issues at all since starting SmartShine Ultra and he looks like a million bucks. This is a great product!